Good morning, friends in Civics. 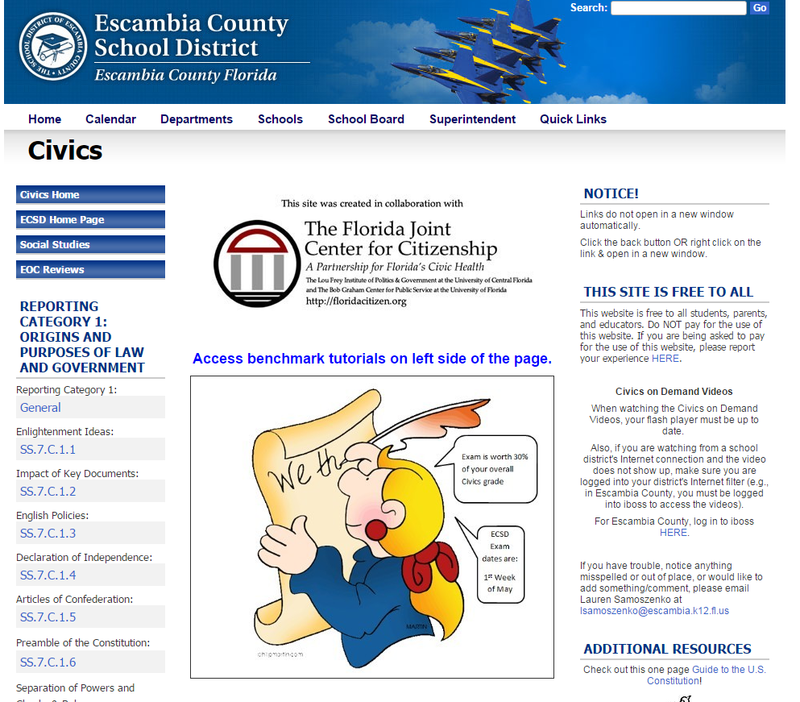 Over the past few years, teachers here in Florida and elsewhere in the United States have made heavy use of the Escambia Civics Review Site. We do believe that the partnership with Escambia County and the willingness of that district to host and share resources for teaching and learning has been beneficial for everyone. Over time, however, requests have been made and ideas contemplated about improvements that could be made to make that site even better. These requests and ideas include more student friendly videos, more helpful assessment tools, and resources for ESOL students and struggling readers. With that in mind, the Florida Joint Center for Citizenship, in partnership with Escambia County Schools, is excited to announce the launching of a new Civics review site that will, later this summer, replace the currect Escambia Civics Review Site: Civics360. Civics360 is free to all registered users, much like our current Florida Citizen website. This site is now live and available for your use. So what are the new features you will find in Civics360? Take a look at the orientation video below, which walks you through the registration process, and read the rest of the post to learn about what we hope will be a useful resource for you and your students. The Florida Joint Center for Citizenship is excited to announce the first in a series of webinars targeting those who may be new to be teaching Civics here in Florida. In this ongoing series, we will be addressing issues of concern around content, pedagogy, assessment, and related areas as requested by our teachers. Did you know that this assessment counts as 30% of a student’s grade, as well as being included in school grade? The webinar will address what exactly you need to know going into the assessment, and we really encourage participants to bring questions they may have about the Civics EOCA! Participants are asked to register in advance. You can register for the webinar here. Questions may be directed to Dr. Steve Masyada. We look forward to your joining us! Even MORE Upcoming FCSS Sessions! So this weekend is the start of the Florida Council for the Social Studies Annual Conference. Have you registered yet? Are you coming? We hope you are coming, because we have some awesome sessions lined up. You can learn more about the keynote speaker here, and you can go here and here to get get an overview of some of the sessions we have planned. So with that out of the way, let’s take another look at some of the quality sessions we have lined up for you this weekend. If social studies teachers properly alter their pedagogical approaches, African American students can learn to appreciate learning about historical facts. This paper focuses upon creative lessons that focus on interactive activities to peak interest. Build academic skills for 21st century students through inquiry-based learning by facilitating easy projects, civic discussions, and document-based questions. Teach students to take ownership of their ideas, work together, and communicate clearly. Now in it’s fourth year, The Great Travel Fair combines ELA, Science, Social Studies, and Math in order for students to understand the regions of the United States through a balance of 21st century skills. Attendees will learn how to use iMovie to allow students to bring stories of Holocaust survival to life. Students become active public historians and create meaningful results by preserving and transmitting these vital personal histories. Utilizing the primary sources in Flagler College’s Civil Rights Library of St. Augustine (CRLSA: http://civilrights.flagler.edu), teachers will learn to effectively teach Florida’s involvement in the civil rights movement, grades 4-12. This session provides resources—both content and pedagogical—for effectively teaching contextualization and its companion skill of comparison. It addresses the much increased role of contextual thinking in the new exam format. This has been just taste of the possibilities. Please be sure to check out additional session descriptions at 2016-fcss-session-descriptions, and earlier posts on what is shaping up to be a great conference session here, here, here, and here on why you should attend! Hey, it will be worth it for the trick or treating alone! You can register for FCSS online. It’s a great and affordable conference, and a chance to meet folks you can work with and learn from. Hope to see you here in Orlando. The hashtag for the conference, by the way, will be #FLCSS16. Join us! The FJCC is Looking for Item Writers! Update: We have sent out invitations. Thank you for your interest! Do you teach social studies in Florida, particularly civics? Do you have or would like some experience developing EOCA type items? 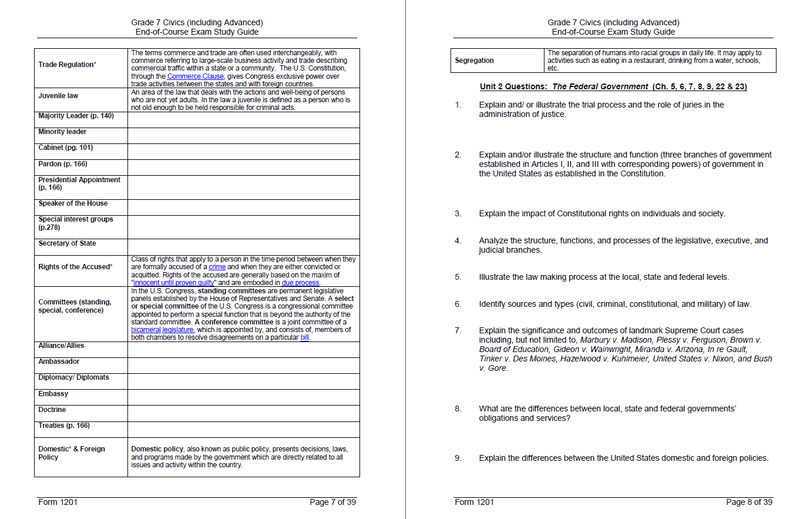 Do you understand the 7th grade civics benchmarks and the role of the benchmark clarifications? Then we would like to bring you in to the Lou Frey Institute on the 13th and 14th of June to work on helping us develop items for EOCA practice and review! This will be a two day session. While the agenda is still being crafted, it will be led by our Dr. Terri Fine and yours truly. Day One will provide and overview and experience with the process and Day Two will give you the opportunity to write items! You will be compensated for your time, travel, and effort. We are hoping to recruit up to ten folks for this project, and would like at least regional diversity in participants. If you are interested, please shoot me an email, describing your teaching experience, item writing experience if any, and your district and school. Once we have ten folks, we will be ready to go. Thanks for your willingness to help your fellow teachers here in Florida! Today’s post comes to us from the new Florida DOE Social Studies specialist, Mike DiPierro, by way of our own Peggy Renihan. Thank you, Peggy, for sharing this. Please consider participating in an opportunity to collaborate with the exceptional student education community. The task pertains to students taking ALTERNATIVE assessments for civics or U.S. history because they are on access points, regardless of their classroom placement. Therefore the standard civics or U.S. history end-of-course assessment does not apply to those students. In order to build a more valid and reliable assessment tool for these students, the Florida Department of Education is looking for active teachers in these subjects, civics and U.S. history, to volunteer to participate. The Bureau of K-12 Assessment is looking to add social studies teachers (middle school and high school) to the following meetings: June 14-15th and June 27-30th. For teachers not on contract, a stipend is paid to them as well as reimbursement for travel. Both trainings will take place in Orlando. Interested parties should reply to Angela.Nathaniel@fldoe.org no later than May 13, 2016. One of our ongoing projects here in Florida is to meet the demand of our stakeholders for assessment items that are aligned to the Florida 7th grade Civics benchmarks. In pursuit of this, we have spent a great deal of time creating new items of varying complexity levels in order to fill holes in the Escambia and FJCC teacher item (free registration required) banks. Well, we finally have finished the first round of item development, and we have just posted 65 new items spread across the 35 assessed benchmarks. We will continue to develop new items and refine old ones. We hope you find these useful, and thank you to Dr. Terri Fine for the work she and her folks did in getting these items completed. To access the items, please visit our 7th grade resources page. Registration IS required, but all of our materials are always 100% free! The 65 new items are spread across the benchmarks and are low, moderate and high complexity items. Not all benchmarks have new items, and some benchmarks may only have one new item, depending on what was needed between the main FJCC site and the Escambia Civics review site. The new item breakdown is below, with item cognitive complexity in parenthesis. The Middle School Civics EOCA is just around the corner, and we have been asked about resources that might be useful in reviewing for the exam. So without further ado, here are some possibilities that could serve you well! I have personally reviewed each of these resources, and am comfortable recommending them to you. And if you have any additions to this compilation, please feel free to share! Click on the link in the heading or in the text to access the resource. 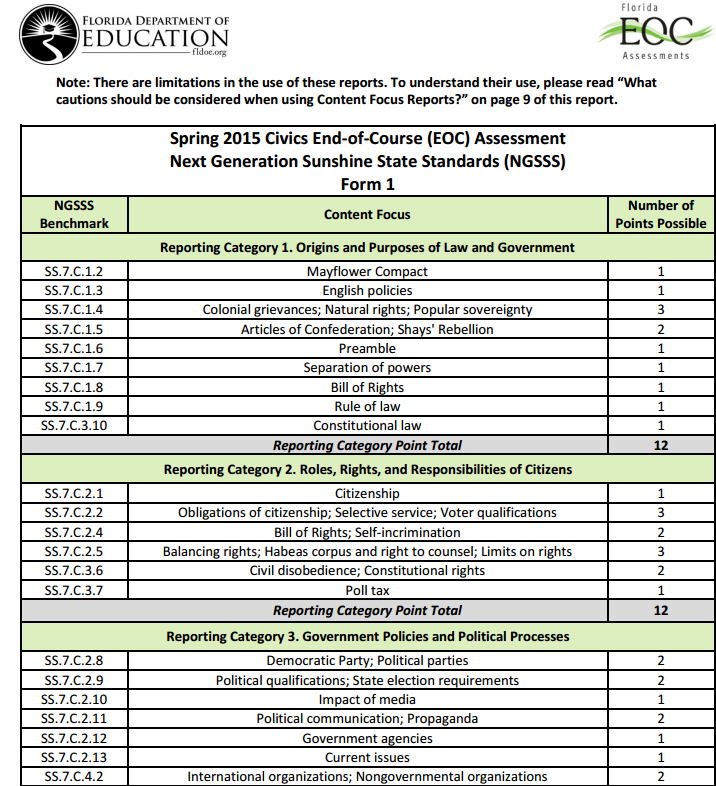 The 2015 Civics Content Focus Reports give you at least some idea of what the test might look like. Be sure to note the cautions on page 9. You will also want to review the Civics EOC Test Item Specifications, which you hopefully have been using throughout the year! We have written about these tutorials before, and they are the first resource I recommend for both instruction and review. They are excellent for a flipped classroom model as well. If you are planning on using them as a review resource, I recommend assigning students only the parts of the tutorials they need, and it would be more effective to perhaps set these up in learning stations across the classroom. You could require that students screen-capture or write down responses to the assessment elements in order to ensure completion and comprehension. 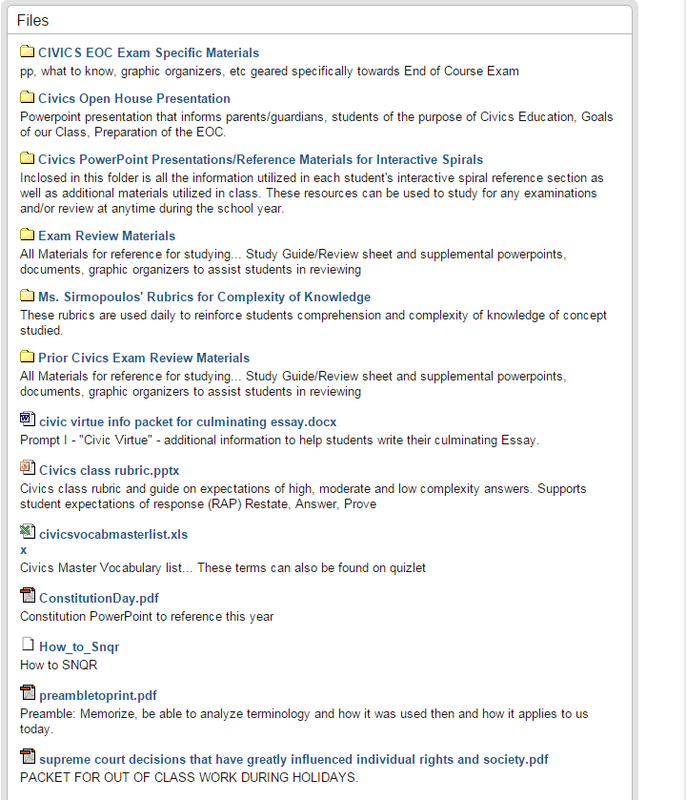 The Escambia site is one that we helped develop, so we do have some attachment to it, but we also believe that the Student Friendly Readings for each benchmark clarification, as well as the assessment items (with answers) and Quizlet vocabulary review tool can serve you well in a review effort. Students can use each of the one page readings to refresh key content that they need, and it lends itself well to a learning center or small group model of review. The recorded review sessions, available for free at the bottom of the FLVS page, do a good job covering elements of each of the four reporting categories that will be assessed on the EOC. Because they are about 2 hours long, you will want to preview each one and determine where you might want students to focus their attention. They may also provide you with a model for your own approach to classroom-based reviews. I especially appreciate how an effort is made to integrate assessment elements. Please be aware that you will need to download Blackboard Collaborate to run the videos. 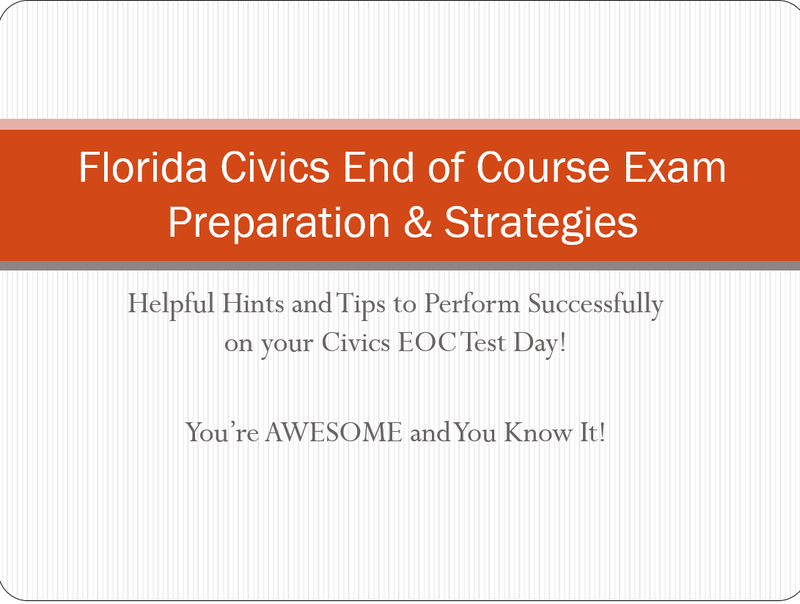 You will also want to check out the FLVS Civics EOC Practice test, which may be of use to you. Again, however, this shouldn’t be the first time that students are being exposed to these types and styles of items. Answers to the practice test items are available here. Note that answers are actually explained as well, which is an excellent element of review. I would suggest actually having students explain WRONG answers. If they can tell you why an answer is wrong, they should have a much easier time of figuring out why an answer might be right! We wrote about this review model last year, and it may be one that you find useful as well. It worked well for Randall Middle School, and it is a positive way to mix things up a little for both you and your students. We explored this model in great detail in this post, and I encourage you to take a look and see if it is something you might like to do. Many districts have done a good job developing practice tests and review sheets for the EOC. Based on what I have had a chance to see, I can recommend a couple at the least. Marion County, which has fantastic leadership in the social studies department, has provided teachers and students with an EOC study guide, made up of a mix of short answer questions, EOC style questions, and vocabulary, all of which draw on the test item specifications. All or part of this is something that I encourage you to adapt and adopt for your own review. Even having the students collaborate on the completion of the study guide could be a huge help for them in preparing for the EOC. Note that the guide is developed in conjunction with their own particular pacing guide and text; you can adapt the chapter and unit headings where necessary. Pasco County has provided a quality practice test as well, though I prefer the FLVS version because of the answer explanations. Still, it is another way to measure student understanding and get a sense of areas of need while also ensuring ongoing exposure to EOC type questions. 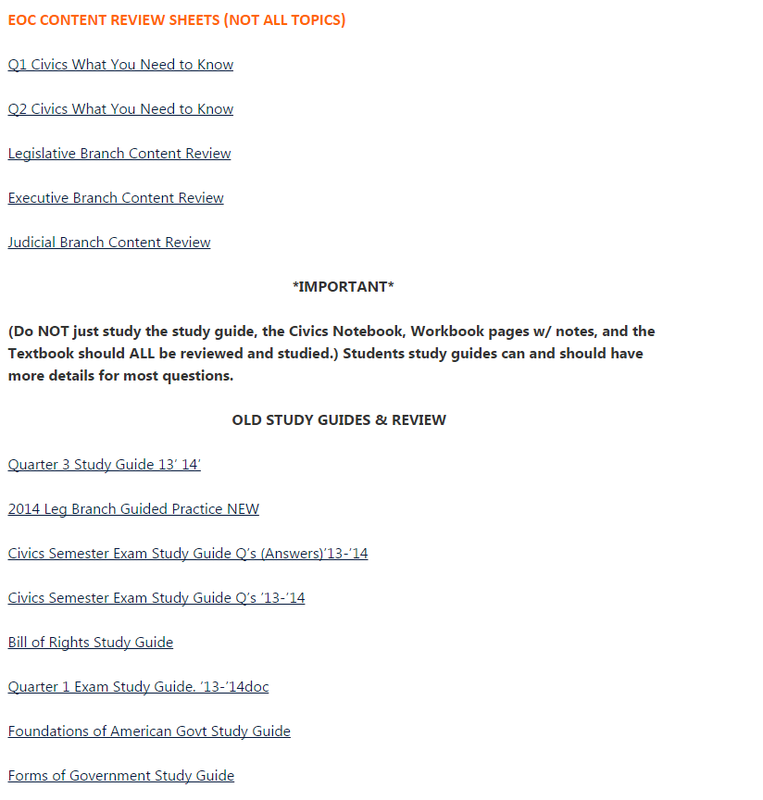 Mr. Kula, social studies teacher at Westpine Middle School in Broward County, has compiled a number of quality content rich and illustrated study guides for the Civics EOC that could be useful for you. While they don’t cover every benchmark, what IS there is effective, and broken down by topic. These would be appropriate for students to use in conjunction with a written review or in small groups using an ‘expert group’ teaching model. Here is an EXCELLENT and short powerpoint covering strategies for the EOC. I cannot recommend it enough! 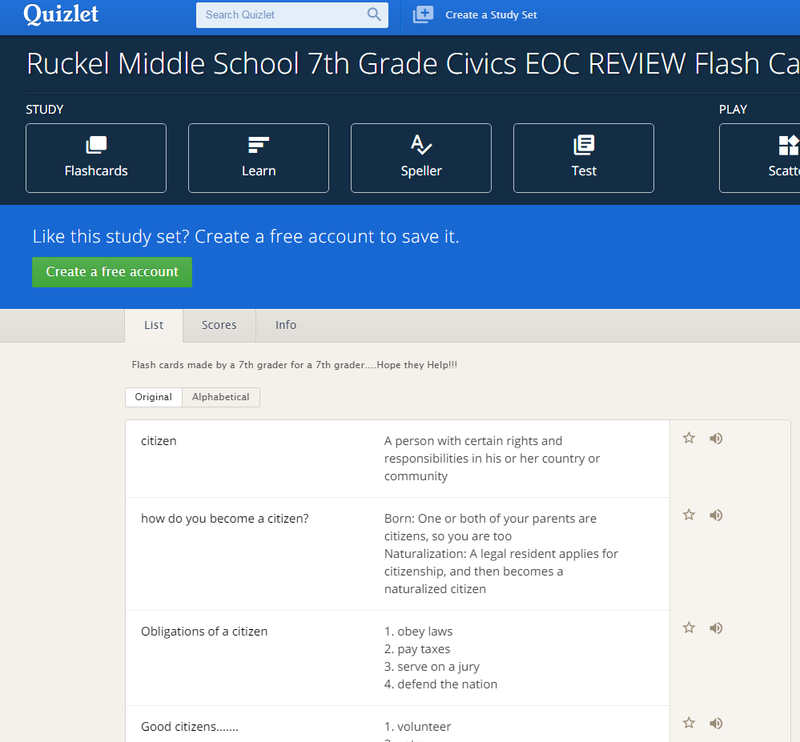 Ruckel Middle School, in Okaloosa County, has developed a tool using Quizlet that provides students with flashcards for review. These might be useful as a bellringer or exit slip activity as you wrap up content this year and start to transition to in depth review. Jackie Sirmopoulos, an excellent and wonderfully effective teacher at PK Yonge Lab School in Gainesville, has been teaching Civics, with some of the highest scores in the state, for awhile. She has provided a plethora of useful review materials that I encourage you to explore. I have looked at almost all of them in each folder, and are all well aligned to the benchmarks and useful in helping you start to address possible student deficiencies while ensuring understanding among all of your students. These are just a few of the quality review resources that you might find beneficial. If you have any additional resources to share, please shoot me an email or leave it in the comments! Justifying Our Existence: Does Our Work Matter? As readers of this blog and supporters of the Florida Joint Center for Citizenship are no doubt aware, the past few months here at the FJCC/Lou Frey Institute have been a bit stressful. The Florida Legislature seems to have essentially decided that the state should not be in the business of funding professional development organizations, tools, or resources, and that anything of value can and should be paid for by the districts. While our own funding was saved at the last minute, thanks no doubt to the efforts of folks like you, we remain in a precarious position. In order to continue to be supported by the state, and not have to charge districts a great deal of money to support us, we have to start providing data to the legislature and to the governor’s office. Now, we do have some excellent data that we have provided them before. We know, for example, that usage of both our own site and the Escambia civics site, for which we provide a great deal of resources and support, is incredibly high. Figure 1 illustrates usage of the FJCC online resources. Figure 3 illustrates usage of the Escambia site. (Click on each image to enlarge it if you need to). So what does the data we have say? More than 5,600 Florida teachers and district personnel, from every district in the state, maintain active accounts on the Institute’s website, providing them with access to professional development, instructional and assessment resources. 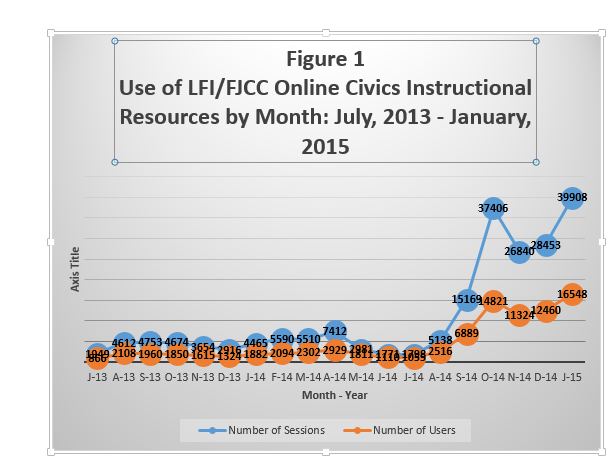 In FY 2014-15 to-date, more than 59,000 users of the Institute’s civics resources website have generated more than 170,000 work sessions as teachers have come to the site for support materials (Figure 1). Monthly utilization rates have grown exponentially in FY 2014-15 following the first administration of the Civics EOC in the spring of 2014. Further growth is anticipated in advance of the 2015 test administration date. The Institute’s daily impact on teachers touches virtually all Florida school districts. Figure 2 shows the distribution of usage sessions by school districts to-date for the current fiscal year. Heaviest use is from the state’s more urban districts. Four of the state’s most rural districts are not making use of LFI/FJCC resources. 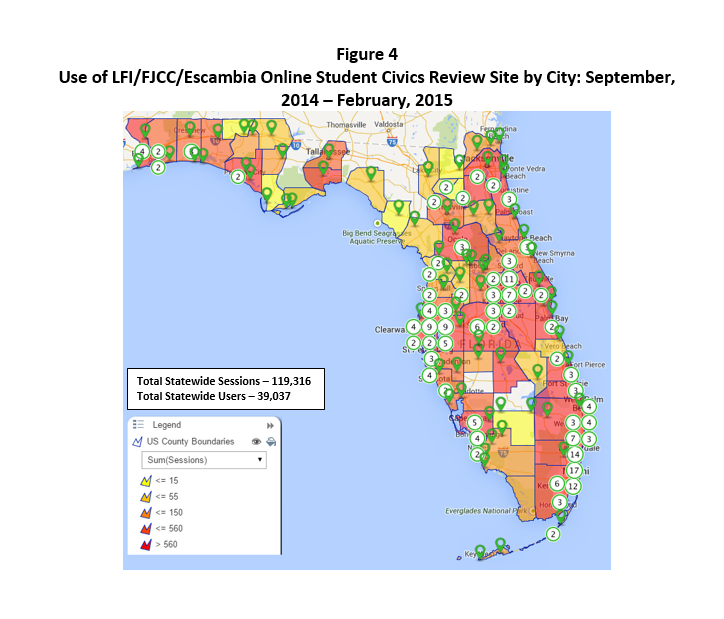 We are currently coordinating with FLDOE’s outreach to lowest performing districts to address this issue. 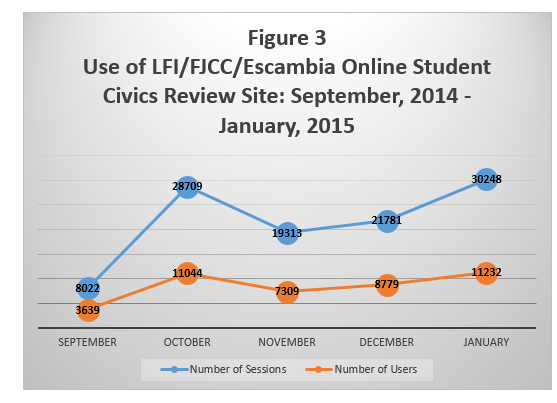 In the five month period from September, 2014 through January, 2015, almost 40,000 student users accessed materials on the Civics Review Site in just under 120,000 sessions. (Figure 3). The general trend line is up and student access is expected to grow further in advance of the 2015 EOC administration. The Student Review Site is serving the needs of students from virtually every district in the state (Figure 4). Use is most intense in the more urban areas of the state. Five of the most rural districts are not making use of the Student Review Sites. 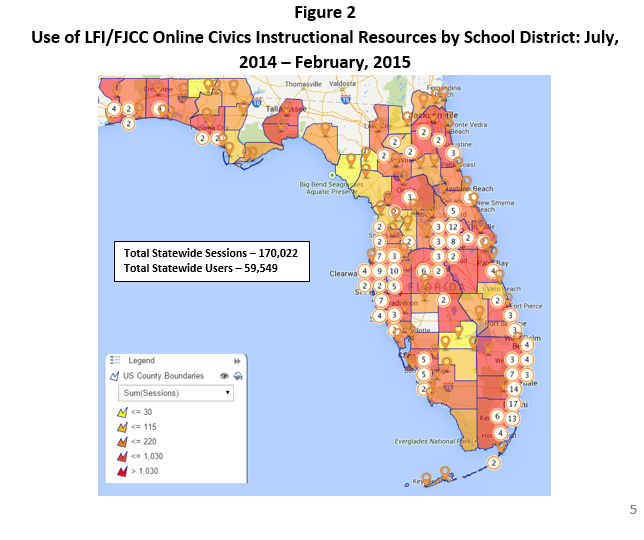 LFI/FJCC is currently coordinating with FLDOE’s outreach to lowest performing districts to address this issue. This is good data, data that we are excited by and that we believe is making a difference. Civics scores increased this year, and we believe that we may have played a role in that increase. HOWEVER, the data that we have is not data that will impress the state legislature and the governor’s office. We need to directly connect our work to student EOC achievement scores, and in this we face a challenge. The state leadership does not want stories, though we have so many good stories that we can share and will share. They want hard numbers, or the stories that we do have will be nothing more than melancholy reminiscing. It is difficult, however. How do we separate out the noise that is inherent in this sort of data collection effort? After all, we are not the only civic education organization in Florida, nor are we the only resource that is being used. At the same time, we don’t always know just HOW the resources and PD we provided is being implemented in classrooms, schools, and districts. And, of course, the biggest problem we face is actually getting those numbers that we need. We must, essentially, be able to match student test scores to specific teachers, and that requires a great deal of finesse with the system. Most significantly, we must rely on the Education Data Warehouse to share with us this data, and that can sometimes be difficult. We must also convince teachers to allow us to match them up with those student scores. If we are unable to do this, well, despite the good work that we believe that we do, the Florida Joint Center for Citizenship will most likely cease to exist. Of course we recognize the need to demonstrate our impact; it’s getting access to the data that we need in order to do this that is the difficult process, and it is a bit of a frustration that the impressive usage data is not adequate for the task. To facilitate this effort, as we relaunch a revised version of our website in the fall, we are going to ask that all users re-register on the site, and we humbly request that you provide us with enough registration data so that we may match users to scores. Please keep in mind that we will not be publishing individual scores or personally and publicly identifying teachers and scores; rather, this will simply be for justifying our continued existence to the legislature and the governor (assuming, of course, that the data is positive, which we believe it will be). We believe, deeply, in the mission of the Florida Joint Center for Citizenship. We believe that the work that we do here does help teachers, schools, and districts in helping to develop that next generation of Florida, American, and global citizens. We hope that we may be allowed to continue that work, and that you might be willing to help us do so. We thank you for the support that you have provided in the past and in any support you choose to offer, and for your understanding as we work to collect the data that we so desperately need. For now, if you have used our resources or attended our PDs, we would love for you to complete this survey that may help us. The Civics NAEP Results: How Does Florida Stack Up? Well, considering the state of social studies education in the 21st century, is this really any surprise to anyone? In 2014, twenty-three percent of eighth-graders performed at or above the Proficient level in civics. 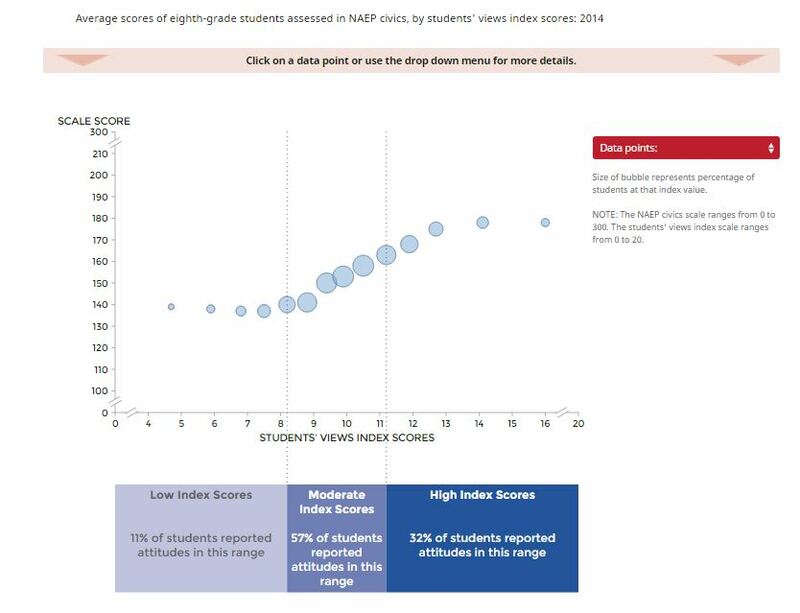 Students performing at or above this level on NAEP assessments demonstrate solid academic performance and competency over challenging subject matter. The percentage of students performing at this level was not significantly different from the percentage in either 1998 or 2010. The percentage of students at or above the Basic level (74%) was higher than in 1998. For many of these students, middle school is the first exposure they have to civics -oriented concepts and ideas, in many cases, we cannot even agree on what those concepts should be. It really should be no surprise that some of our students struggle. Let’s remember, too, that for the NAEP, the ‘Basic’ level requires students to demonstrate at least SOME partial mastery of the comment, and the report notes that 74% of tested students were at the Basic level. This IS a positive, because it means, in my view, that we ARE starting to see a change in civic knowledge and proficiency. You have to see positives, and you have to start somewhere, and we can hope that perhaps this might spur some real action on civic education; action that involves more than requiring kids to take a multiple choice test where they can simply memorize answers and doesn’t really require much in the way of civic understanding or even in depth knowledge. The contextual breakdown within the NAEP report is, to me, fascinating. Comparing students’ responses in 2014 to responses to questions about classroom practices in 2010 shows some changes. Higher percentages of students in 2014 than in 2010 reported watching movies or videos and using a computer at school at least weekly. The percentages were lower in 2014 than in 2010 for students who reported reading from a textbook, discussing current events, and taking part in role-playing, mock trials, or dramas at least weekly. It is great news that students are using the textbook less. We all know of the problems that textbooks pose to quality instruction (though they CAN play an important role! ), but the fact that pedagogy that actually engages students while reinforcing instruction is really unfortunate. Active learning is such an important element of the social studies, and even with traditional assessments always looming, it deserves to remain a part of our field. The chart below also stands out to me, because I think it says a great deal about how civics should be taught. If we engage our students, our students will learn. If they can feel connected to the material, and understand why Civics matters, they will learn! So how does this compare to civic education in Florida? Do we have data we can look at? Happily, yes. 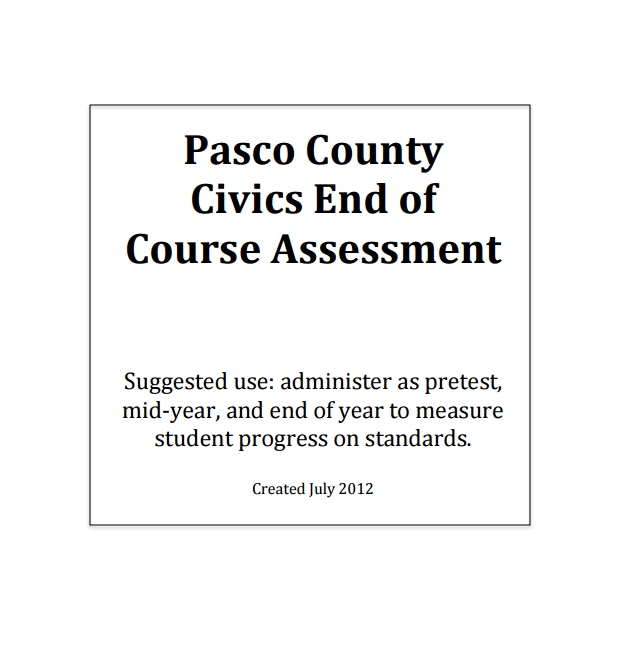 Now, it should be noted that unfortunately the NAEP does not have state level data for the Civics assessment, but Florida’s middle school Civics EOCA covers the same material that is on the NAEP test. For those of you outside the state of Florida, or in Florida but not aware, this state is one of the few with an actual requirement for civics to be taught, and assessed, in middle school. This is a result of the Sandra Day O’Connor Act, which mandated both the course and an assessment (you can view the standards, benchmarks, and assessment items through our website. simply click the benchmark to see more). So, how do our Florida kids stack up? The first official administration of the test was given last spring, and 61% of middle school students that took the assessment scored a 3 or higher (on a 1-5 scale), which makes them ‘proficient’. This compares positively to the 23% that scored at proficient on the NAEP. 15% of Florida students scored a 5 on the test, while only 2% scored comparatively on the NAEP. Of course, the caveat is that the two tests are NOT 100% equivalent in scoring, structure, or specific content, but they are close enough that I would not hesitate to say that Florida kids do have a grasp of citizenship and the roles of citizens that perhaps exceeds their peers in other states. We still have a GREAT deal of work to do, particularly with minority students and special needs kids, but we have begun! This was the first administration of the Florida civics test. With funding from the Legislature, the Lou Frey Institute and the Bob Graham Center, through the Florida Joint Center for Citizenship, are working with schools that are struggling with civics. We expect to see Florida’s students understanding of civics continue to improve in the coming year.